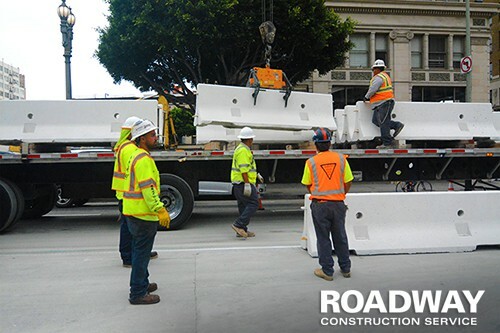 Are you preparing to order temporary road barriers for your work zone traffic control? This is a step that shouldn’t be taken lightly. These safety barricades form an important component in any work zone traffic control strategy. Roadway Construction Service has focused abundant attention on the area of temporary road barriers. In fact, our commitment to this area is a primary reason we’re regarded as one of the top traffic control companies in Southern California. Achieving this status in the world of California traffic control is no easy matter. To make the grade, we’ve gone the distance to raise temporary traffic control to the highest level. And that requires solid strategies for the deployment of road traffic barriers. In our hands, every traffic barrier is of prime importance. As we see it, this is the only way to maximize the safety and reliability of traffic control in California. Before considering any road barrier for traffic control duty, we must think about its functionality. What job will it do? How will it contribute to effective traffic control? Not exactly a piece of cake. We have a wide range of road barricades to choose from, each with its own way of contributing to our overall road traffic control strategy. We may, for instance, be tasked to restrict traffic from crossing into unauthorized areas. For this purpose, we utilize perhaps the most formidable of traffic control solutions – the wall-like k rail. Also known as Jersey barrier, this is the mightiest of safety barricades. As a group, Jersey barriers are big and strong – and obvious. K rail is available in two types. Comprising one type are the concrete k rails. Made of solid concrete, they are utilized primarily for long-term construction projects. As anyone can imagine, their massive bulk makes them a challenge to move. Therefore, they’re used only when they’ll be needed for a long, long while. When a temporary road barrier solution is required, plastic Jersey barriers get the call. These are made of a resilient plastic shell, with a hollow water chamber inside. The major advantage of these plastic traffic barriers is their lightness. Without the bulky poundage, they’re relatively easy to move and set up. What gives plastic Jersey barriers their strength? As mentioned above, each segment contains a hollow water chamber. Once the road barricades are set up, the chambers are filled to capacity with water. This liquid filling provides an effective level of weight and strength – basically creating the solidness of a wall. As with all other road traffic barricades, Roadway Construction Service has developed a highly reliable system for k rail deployment. Whether you need concrete rails or water-filled barricades, you’ll discover our k rail rental program meets the most stringent requirements. We offer the most reliable equipment maintained for maximum performance and safety. And we back up the program with customer-focused service that’s second to none. When you need Jersey barrier rental for a project or event, you can’t do better than Roadway Construction Service. That takes care of the big barriers. But what about the deployment of more compact solutions for less demanding situations. Consider it done. 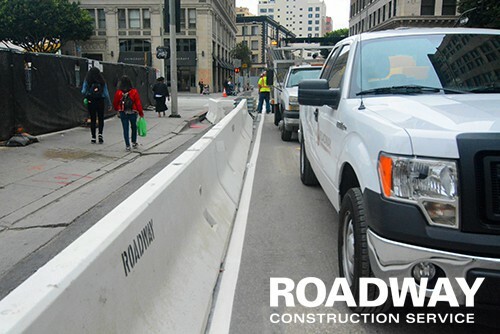 Roadway Construction Service provides and deploys a wide range of temporary traffic barriers for a variety of needs. Not one of them, not even the smallest, is considered less important than any of the others. Traffic cones are a good example of our open-mindedness. The most compact of road barriers, they’re nevertheless given plenty of attention by our team. And with good reason. They may not have the muscle of Jersey barriers. But on the visibility scale, they’re top of the line. After all, it’s hard to miss that fashionable, bright orange color so prominently displayed. Sometimes, we even get the opportunity to display our artistic ‘talents’ to the road-traveling world. This happens when our master artisans perform road striping services. These neatly painted lines establish clear boundaries for lanes and other traffic paths. Naturally, there’s a lot more to traffic control services than the deployment of temporary road barriers. To make any barricades perform up to standard, you need a well-rounded traffic management strategy that covers all the bases. Which is why we complement our system of road barricades with the most capable experts anywhere on the planet. The duties of a work zone traffic flaggers clearly showcase some of this in-house expertise. Thoroughly trained for their important role, these individuals form a system of highly-effective communicators. With a combination of signs and signals, they control the movement and therefore the safety of everyone and everything in their assigned area. This includes vehicular traffic, bicyclists, pedestrians, and even lovable pets. Yes, the work zone flagger must be top of the game. And to make sure they are, each one is qualified by the industry’s highest certifications, including the OSHA designation. Before temporary traffic barriers and work zone flaggers are deployed, something crucial takes place at central control. What occurs is the development of our acclaimed temporary traffic control plans. For this, our team of strategists focus on a wide range of variables. Among the variables considered in the process of traffic control planning are road conditions, lane closures, and volume of traffic (includes vehicles, bicyclists, and pedestrians). Not only are temporary traffic control plans vital for effective deployment of resources; they’re indispensable for getting permission to perform services. Before our team can set down even one traffic cone, we must acquire all necessary municipal traffic permits. That requires an air-tight plan. Fortunately, we have the in-house expertise and resources to reach this objective on a regular basis. Rest assured, when we develop a traffic control plan for construction sites, it gets results. So that’s how our road management services provide a system of temporary road barriers for your work zone traffic control. A great deal goes into the mix — the deployment of k rail and cones, the training and assigning of every work zone flagger, the development of temporary traffic control plans. Every element underscores our commitment to excellence and distinguishes us as one of Southern California’s premier traffic control companies. Clearly, when you need a traffic control service with the right solutions, you can count on Roadway Construction Service all the way.